The idea for this essay began with my father’s cousin, Howard Sherfick. His mother and my father Robert’s mother were sisters; the boys were just four months apart in age. One of my favorite family photos shows Howard and his mother, along with Robert and his dad, during a family gathering a few months after the boys were born. After my Dad died in 1986, Howard (whom I’d never met before) offered to help me become acquainted with the “homeland” of my father’s family in Martin County, Indiana. 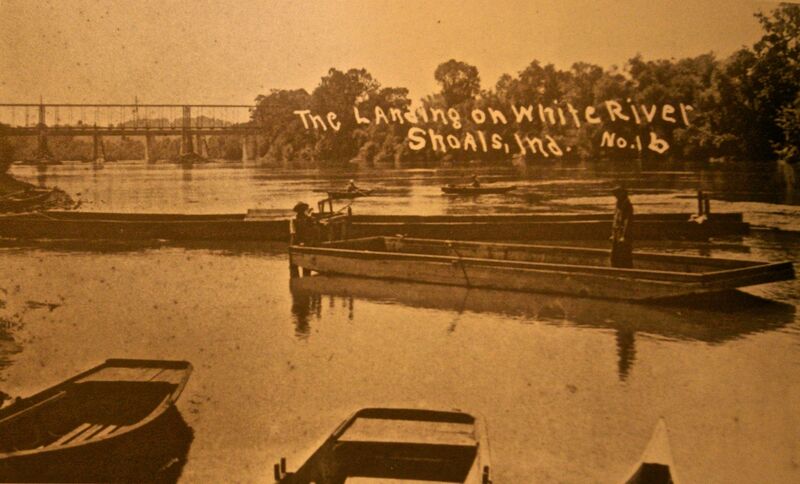 Over the next twenty years, Howard took me on excursions into the countryside around his town of Shoals. In the process, he introduced me to sites of significance to my family’s story. He also told me some of Martin County’s colorful history and showed me artifacts such as a large mussel shell he’d once found along the White River near Shoals. 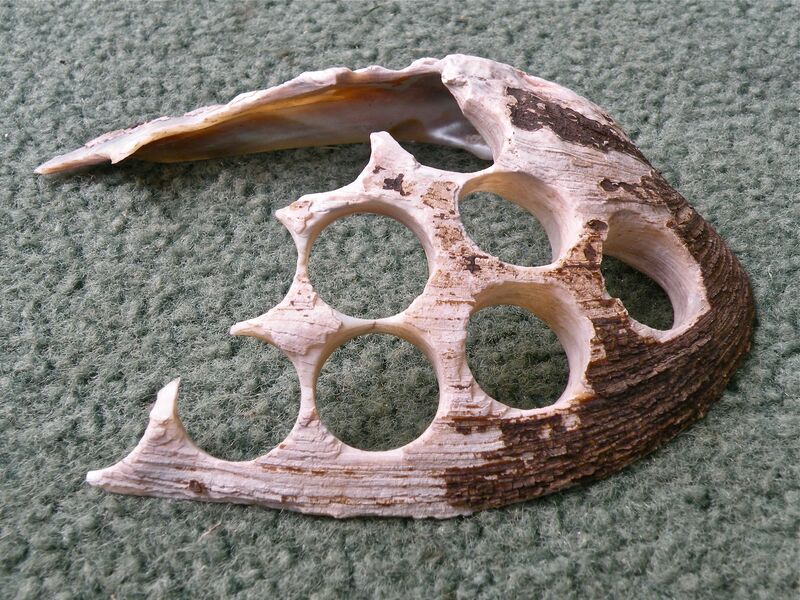 I’d seen mussel shells before, but none like this one. It looked as if it had been worked over with a cork-borer and had several large holes in it. Howard explained to me that this shell, and others like it, were all that remained of a once-thriving shell-button industry that existed in Shoals during the first half of the 20th Century. I never forgot that conversation or Howard’s shell. Historic mussel shells. They don’t make these anymore folks! $10 for the lot. I bought the jar of shells and brought them back to Minnesota with me. They, along with my recollections of fond times with my friend Howard, have inspired the writing of this essay. Howard passed on in 2011; I am dedicating this essay in his memory. After all—he started it. “Mussels are an acquired taste,” she said. I’d never eaten mussels, so I took the television talk show host’s word for it, and especially since she was interviewing a renowned chef at the time. Except for gourmet chefs, celebrities, and others with exotic gastronomic tastes, I doubt that many other people even have an awareness of mussels. But that has not always been the case. Shell mounds were once found all along the lower reaches of the East Fork of White River in Indiana. This river is especially significant to me because the homelands for both my mother’s and my father’s families are located along it. My mother’s family settled in the mid-1800s along White River near the tiny village of Rockford in Jackson County, Indiana. Although I know of no prehistoric shell mounds there, mussels were once plentiful in the river. The river bordered one part of my grandmother Christine Rapp’s farm, and part of that stretch was known as “Tanglewood.” That was where several generations of Rapp children learned to swim; a large sandbar there offered ready access to the river. I also went swimming at Tanglewood as a young boy. I was usually in the company of my grandmother and some cousins whenever I visited her farm in summers during the 1950s. It was on that sandbar in White River that I first encountered mussel shells. My cousins and I used to collect shells from there and bring them back to my grandmother’s house as souvenirs of our outings. We placed our treasured shells along a railing on the side porch of her house where we could admire them. I imagined all sorts of creatures living in those shells, although I don’t recall ever seeing an actual mussel then. I also was impressed by their shiny inner surfaces. I hadn’t yet seen a saltwater seashell at that point in my life, so these mussel shells were most fascinating and mysterious to me. And the truth is, I didn’t know the half of it then! It’s been estimated that about three to four hundred species of freshwater mussels existed in the waterways of the United States at the time of European settlement. A high proportion of those were in the drainages of the Ohio River, which includes the White River of Indiana. Mussels are among the longest-lived animals in the world; one was documented to have lived more than 130 years! The life cycle of freshwater mussels is simply amazing. First a male mussel senses the presence of a nearby female and releases its sperm into the river water. The female then captures some of that sperm and uses it to fertilize her eggs. So far it sounds fairly routine, but then comes the amazing part. The female extends an appendage from her body and lures a fish to come near because the structure resembles a minnow or worm. When a fish nips at the bait, the female knows to release her eggs into the water. Some of the eggs attach to the fish’s fins and scales and live there for several weeks. They eventually detach from the fish and fall to the riverbed where they begin to grow into young mussels. By the time they leave the fish, they have traveled several miles from the initial point of attachment. In this way the range of the mussel colony is extended. Amazing! The earliest humans who lived along White River probably arrived about 9000 to 10,000 years ago. Some of the areas to which they came are now in Jackson and Martin Counties of Indiana. This region wasn’t glaciated during the most recent Ice Age; the glaciers stopped a few miles farther north. During the initial post-glacial period, people survived by hunting animals and gathering wild plants, but over time they also began to use freshwater mussels from the rivers. They continued to do so for several thousand years. Mussels are edible, and they may have contributed protein and minerals to the diets of prehistoric people. Yet studies show that they would have had to collect large numbers each day for mussels to have been a principal food. So it seems likely to me that mussels were more of a supplement to their diets than a mainstay. Or…could it be that mussels were important to prehistoric people for other reasons than food? The Shell Mound People also used mussel shells for ornamental and ceremonial purposes. When I first encountered mussel shells while swimming in White River as a boy, one of their qualities that most impressed me was the luster of the inner surfaces of their shells. I imagine that early prehistoric people also found these mother-of-pearl linings of the shells to be beautiful. And then there are the pearls. 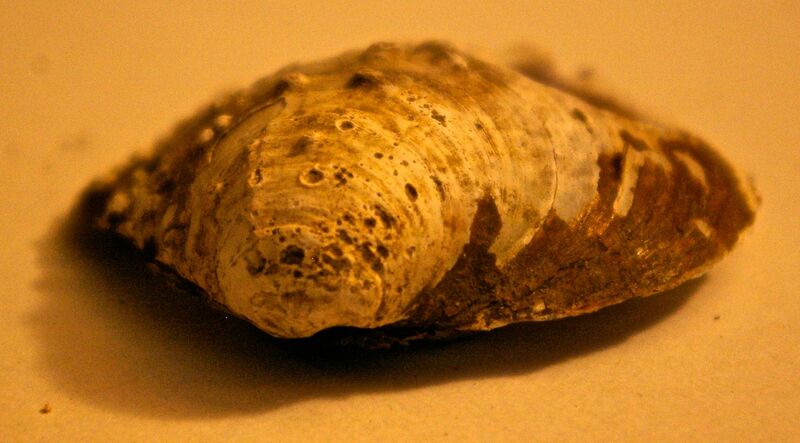 Mussels can form pearl-like structures, although they are seldom spherical like the pearls from oysters with which most people are familiar. They are usually irregular in shape and sometimes wing like or ridged. Such pearls, infrequently formed as they are inside the mussel shells, were surely a source of wonder and mystery to early people. Evidence for this is the thousands of freshwater pearls found buried in a ceremonial mound dating to the Hopewell culture many hundreds of years ago. But most compelling for me is the fact that shell mounds, including some in Martin County, were situated on the tops of high hills and bluffs. If these were simply refuse piles of discarded shells, it doesn’t seem reasonable to me that the people would have hauled the shells up from the rivers to such high places. One 1990s research study proposed that some shell mounds were actually human burial sites. As evidence, that study drew attention to one large shell mound in Kentucky that contained almost one-thousand burials! I don’t know of any burials in the shell mounds of Martin County, but that doesn’t mean they weren’t there at one time. None of those mounds, to my knowledge, were systematically studied, and most are now gone. I think that mussel shells came to have a spiritual and/or symbolic significance to the Shell Mound People along White River. 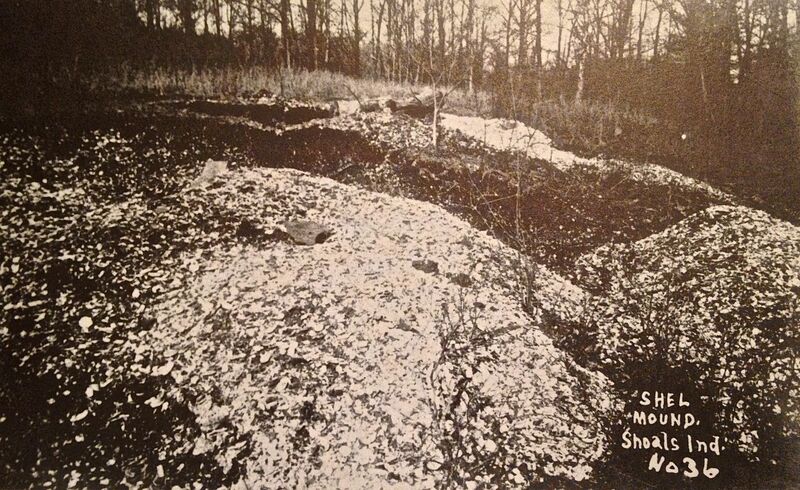 In their time, earthen burial mounds had not yet been used, so shell mounds may have served to mark the final resting places of the dead. In some early cultures, it’s believed that shells symbolized “completion.” Thus, mussel shell mounds along White River may have signified the completion of life within the belief systems of these early people. This may have been discontinued as earthen burials later became a more common practice. Mussels might have also been significant as symbols of creation and birth. I once encountered a creation story of a group of native people in Canada who attributed their origins to a giant clam. Surely in the minds and beliefs of prehistoric people, any organism that could create a pearl should also be capable of bringing forth life. Grace Green and Lee Simmons were born and reared within a few miles of White River near the town of Shoals in Martin County. They grew up on farms and it’s likely they became acquainted as children with freshwater mussels. It’s possible that Lee (who eventually became my grandfather) used mussels as bait when he fished the river. Raw mussels are tough—tough enough that catfish and other river creatures have difficulty pulling them off the hook without being caught. It makes them an ideal bait. Grace (who later became my grandmother) was a tomboy when she was young. 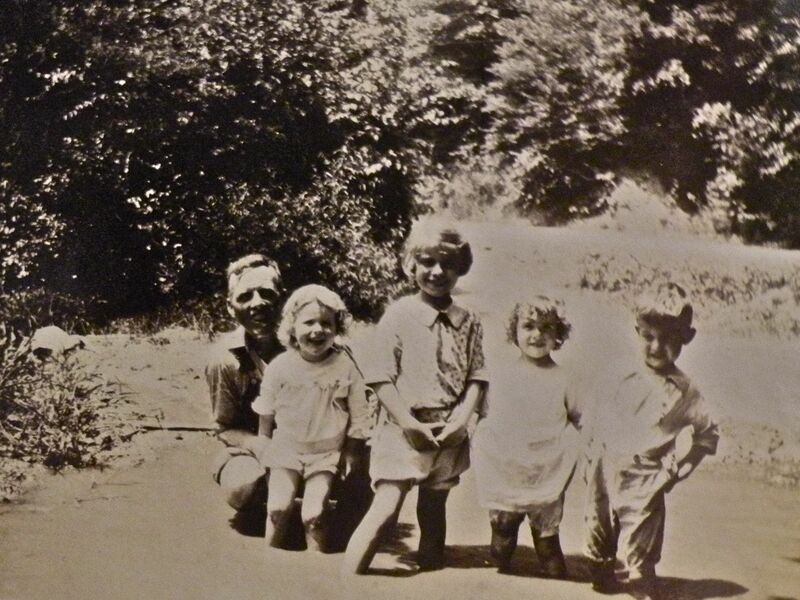 She and her friends sometimes amused themselves by capturing black snakes in the hills around her childhood home. So it’s not hard for me to imagine her collecting mussels for fish bait too. Whether Lee or Grace ever visited the prehistoric shell mounds that still existed in Martin County when they were young, I don’t know. Neither do I have a sense of whether they took note of the lustrous mother-of-pearl surfaces of mussel shells. However, it’s clear that others in Martin County in that time did appreciate the shells–and decided to exploit them–and the White River button industry began. 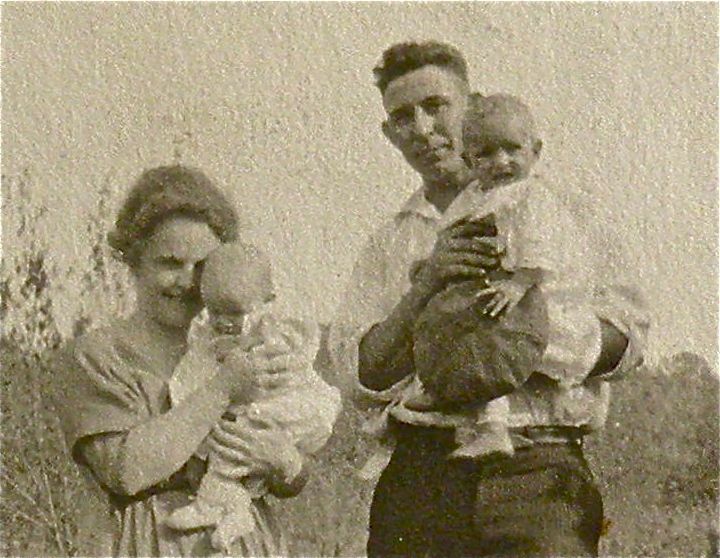 In June 1916, Grace Green and Lee Simmons were married in Martin County. One year earlier, another resident of the county, Fabius Gwinn, built the first button factory in Shoals to cut button “blanks” out of freshwater mussel shells from nearby White River. He became known locally as “King of the button industry” and his factory operated until he died in 1947. Early mussel-button factory operated by Fabius Gwinn in Shoals, Indiana. The workers are seated upon a large pile of discarded mussel shells. Twenty-seven years before Gwinn began his factory at Shoals—and many miles to the west—another entrepreneur, John Boepple, took note of the large numbers of freshwater mussels in rivers around Muscatine, Iowa. By 1891, he had established in Muscatine the first mother-of-pearl button-finishing factory in the United States. Mussel shell buttons immediately became popular and spawned a number of other button factories along the Mississippi River. By 1899, there were sixty factories in the states of Illinois, Iowa, Missouri, and Wisconsin that produced millions of “pearl” buttons each year. This new industry quickly put a strain on the freshwater mussel resources of rivers in these states. For example, in 1899 more than sixteen million pounds of freshwater mussel shells were gathered in Wisconsin alone. As the supply of mussels in rivers close to these factories became depleted, the button manufacturers began looking to more distant sources. Muscatine button moguls knew of the high-quality mussel beds in the White River of Indiana. They began ordering large quantities of mussel shell blanks from Fabius Gwinn’s factory in Martin County, as well as from other factories there. At one point, Gwinn employed 300 people to gather mussels from the river in support of his factory. Buttons were never actually made there; only blanks were cut and then shipped to Iowa for finishing. Within a few years, the button industry in North America was in trouble. Its practices of indiscriminate over harvesting of rivers depleted many of the mussel beds. There were no size limitations on mussels taken in those earlier times. I’ve seen some small shells from that period from which only a single button blank was cut. A single button by itself had almost no value, yet young mussels were still taken by the gatherers. Even larger shells yielded only six to ten blanks per shell. Seventy to eighty percent of the harvested shells were considered “waste” by the processors and discarded into large piles. And the mussel animals themselves living inside the shells were also considered to have little value. After the shells were cooked to kill the animals (and open the shells), the “meat” was removed and usually buried to eliminate odors. Like the mussel animals themselves, the pearls that occasionally form inside the shells were once highly valued by prehistoric people. However, the early button makers considered pearls to be by-products too because they had irregular shapes and lacked the fine luster of oyster pearls. The truth is that such pearls could be purchased for a nominal cost then. Today, however, quality freshwater pearls have high economic value due to their rarity, and natural ones are costly. Perhaps because of the greater distance of the Martin County button factories from Muscatine, and their later beginning, the mussel beds in White River remained productive for the thirty years that those factories operated. They eventually closed after the invention of plastic and its extensive use in manufacturing buttons after World War II. As a result, the demand for White River mussel shells sharply declined. As an environmentalist, it’s easy for me to be critical of the mussel-shell button industry in the United States. It definitely had a hand in decimating the native freshwater mussel populations in many areas of the Midwest. But to be fair, that isn’t the whole story. The first half of the 20th Century also saw widespread dredging of rivers, construction of dams and increased sedimentation due to agricultural erosion, and serious river water pollution from untreated municipal and industrial wastes. All of these factors helped contribute to the decline in mussel populations in areas of the Midwest during that time. Today, freshwater mussels are the most endangered group of animals in the world. It’s estimated that about seventy percent of the freshwater mussel species in U.S. rivers and streams are at risk. This compares with a figure of about sixteen percent for mammals. These people [who gathered mussels from the river] were very poor. A lot of them dug shells for a living, part of the time anyway…They all would go down to the river to dig mussels—the wife, the husband and all the little kids…The money helped them get through the winter…When the water got too cold, they had to quit. Shells didn’t make anybody rich that I know of, but it got them by. During the Depression years of the 1930s, mussel gatherers could earn about $12 per ton for a load of mussel shells, although seldom would any individual accumulate that quantity. Yet whatever cash they earned from mussels was significant. As one long-time Martin County resident recalled: “Back then, a twenty-dollar bill would last a big family a month or more.” I don’t know that my ancestors depended on mussels to “get by” during that time in Martin County, but they certainly must have known folks who did. Ten years or so after the button factories closed, there was a resurgence of interest in gathering mussels from White River in Martin County; a new market for shells had emerged. After World War II, there was a surge in demand for cultured pearls from Japan. The cultured pearl industry favored use of mussel shell “nuclei” from the U.S. to produce such pearls. A secondary market also developed for river mussel shells to make decorative furniture. Accordingly, Japanese companies bought train-car loads of mussel shells harvested from rivers in Indiana such as the White River and the Wabash. As with the earlier button industry, the yield of nuclei from shells was low—only about 60 pounds per ton processed. These nuclei were then inserted into saltwater oysters and within a year the oysters had secreted a thin layer of nacre (the substance of natural pearls) over the mussel shell nuclei, thus creating a cultured pearl. This is somewhat analogous to gluing a think layer of expensive veneer wood over a thicker piece of ordinary wood to make veneer furniture. By 1966, almost two million pounds of mussel shells were being taken from the Wabash and White Rivers to serve this new Japanese market. That’s about when my cousin Mary Lou came into the picture. One of the Japanese companies heard of the high quality of the mussel shells in the White River at Shoals. It established a business relationship with the local feed store there and began buying shells. When word spread that mussel shells were being bought again, Mary Lou Billings and her father, Paul, hatched a plan to begin harvesting shells along their stretch of the river and selling them to the feed store. Mary Lou had grown up on her family’s farm situated along the White River near Shoals. She and her father knew the river well. Mary Lou graduated from the local high school in 1964 just when the revived mussel shell industry on White River was coming into its own. She was also headed to college that fall and figured the income from mussel shell sales could help pay her educational costs. She was right. Mary Lou is my second cousin. She’s distinctive because she and I both share the same birthday—same day, same year. She is four hours older than I am; yet I had never met her in person until the mid-1990s. Since then we’ve been together a number of times and shared our common family and genealogical interests. We’ve also explored Martin County history—and our common affinities for White River mussels! When I recently learned that Mary Lou had earned income by gathering White River mussel shells during her college years in the 1960s, I recognized my good fortune. I could now go beyond just reading about the mussel shell industry in books; I had a cousin who had been in the business! I’ve asked Mary Lou many questions since then about her experiences in collecting mussel shells; here’s some of what I’ve learned. Hunting mussels in White River is something like hunting mushrooms on dry land. You need to know the territory, and once you’ve identified really good places to find mushrooms or mussels, you usually keep that information to yourself. Mary Lou’s father had spent hours fishing White River so he knew the locations of its sandbars and other features. He had also taken note of where mussels were found. Gathering mussels took many forms for Mary Lou and her father. Sometimes she waded in the shallows along sandbars and felt along the bottom of the river with her hands, a process she called “noodling.” Other times she used a digging fork to uncover shells, and in deeper water she used tongs with long handles to acquire them from the river bottom. She usually went to gather mussels twice per day (morning and night) from spring until fall. By the 1960s when Mary Lou was taking shells from the river, restrictions had been established on the size of mussel that could be harvested. Mary Lou recalls that some diggers carried with them a tin can open at both ends. If they had a question about whether a mussel was legal or not, they simply tried to drop the mussel through the can. If it went through, it was too small to take. Mary Lou and her dad transported themselves up and down the river in a flat-bottomed boat powered by a small outboard motor. There were different prices paid for the mussels by the feed store depending on their type. The best prices in Mary Lou’s time were for “Three-ridge,” “Pig-toe,” and “Warty-back” mussels. “Washboard” mussels also brought a good price, but they were more difficult to find and dig because they burrowed deeply into the riverbanks. Some of the mussel types that had formerly been valued during the button-making days because of their large size, such as the “Mucket,” but were less valued during Mary Lou’s time. Scientifically speaking, each mussel type is a different biological genus and species. After gathering mussels for the day, Mary Lou and her father would build a wood fire under a large feed trough containing water. When the water was well heated, they put the accumulated mussels in to cook. “I always had Daddy cook them extra long to make sure those mussels were good and dead,” Mary Lou recalled with a smile. The cooking usually opened the shells and then it was Mary Lou’s job to go through each one, remove the mussel, clean the shell and sort it into piles based on type. The empty shells for each type were placed into burlap sacks and kept until they could be taken to the feed store for sale. As with the button mussel shell gatherers before her, Mary Lou didn’t get rich harvesting and selling mussel shells from White River. But they did earn her enough to help pay for her university education, and that was no small matter. In 1991, the gathering of freshwater mussels from Indiana rivers and streams were closed indefinitely due to the decimated populations. In truth, it was like shutting the barn door behind the horse. In the twenty years since the rivers were closed, none of the native species have recovered. After I brought my Martin County mussel shells back to Minnesota, I placed them in various places around my home. 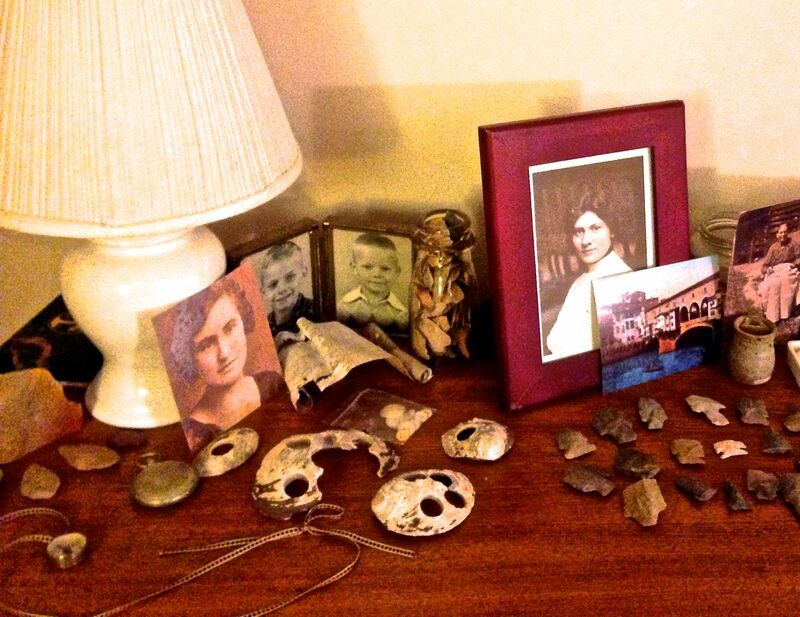 They serve for me as symbols of connections to my Indiana homelands and to my family’s history there. Some are on a table in my writing space; others sit on my bedroom dresser along with additional reminders of my ancestry. My father’s family story is filled with contradictions, just as is the story of the freshwater mussels of White River. There was, for example, my great-great grandmother Marjery Dyer who bore six children by a man she never married–and who was, in fact, married to another woman during the time. I’m descended from one of those children. There was my great-grandfather George Green who later stood up for Marjery and tried to reclaim her good name. Then there was the death of my great-grandfather John Simmons in his 20s, followed a generation later by the untimely death of his son (my grandfather Lee) in his 30s. Yes, my mussel shells represent such contradictions and tragedies, but they also symbolize the resilience I’ve come to appreciate in my ancestors too. I don’t ever expect mussels to be found in White River again in the numbers that formerly existed, but I do expect they’ll recover somewhat over time–just as my family is recovering from its past distresses. I hold a mussel shell in my hand and turn it slowly; each angle offers a different appearance. In one view, the shell appears whole and unblemished. From another angle, its scars and flaws are clearly visible. And button holes in the shell represent for me the missing pieces of my family’s history—persons and their stories that are now lost to time and will probably never be known. But as I examine the mussel shell in my hand, I also note its amazing beauty, and especially the interior surfaces. Their iridescence is multi-hued, and for me they symbolize people and stories in my family that are known to me. There is, of course, my “twin-cousin” Mary Lou whose first-hand accounts of gathering mussels from White River more than anything helped to make this story come alive for me. Then there are those whom I have known in the past but are no longer with me—like my friend Howard with whom the journey to know my father’s family began. Scientists know what causes the iridescent beauty of the inner surfaces of mussel shells. One described it as “multiple reflections from two or more semi-transparent surfaces…” This explanation has its place in science, but it misses the meaning that I gain from observing my mussel shells. I see multiple hues and beauty, of course, but I also see something even more compelling, mysterious and incomprehensible. And I realize that this is what keeps me returning to my Indiana homelands year after year; this is why I am mussel bound. if its place in the universe is not found out. they know hunger, and probably a little satisfaction too. When I complete an essay, I usually feel a large sense of gratitude and fulfillment. For a few days at least, my creative instincts seem to be satisfied and all is well. But within a relatively short period of time the juices flow again, and I begin thinking about writing another essay. In rare instances, however, I find myself feeling as if there still is something yet to know about the essay that was just completed. I might find myself pondering questions such as: “Just why did I write this one?” To an extent, the essay itself answers such questions. In the case of my Mussel Bound essay, it tells me that I was drawn to know more about mussels since they are interesting and important organisms in Midwestern rivers and streams—and most people largely overlook them. In this essay, I also clearly wanted to pay tribute to my friend Howard Sherfick who introduced me to my father’s homeland in Martin County—and who guided me into the story of the White River mussel button industry in the first place. Yet as I continued to live the aftermath of publishing Mussel Bound, I began to understand another purpose for my writing it—reclamation. I touched on that, I think, when I referenced my family’s “contradictions and tragedies” in the final portion of the essay, and in the same breath where I wrote about “scars and flaws” of the mussels themselves. It’s clear now that the troubled story of White River mussels had become for me a symbolic representation of the story of my father’s family. I didn’t fully appreciated it then, but I was writing this essay partly to reclaim good for those in the family’s history who had been previously lost, discounted or disparaged. The recovery of something useful from that which is wasted. When I wrote my previous essays about the tragic circumstances associated with the lives of some of my father’s ancestors, I recovered something useful (at least for me) from that which had been “wasted.” This is a powerful realization for me. 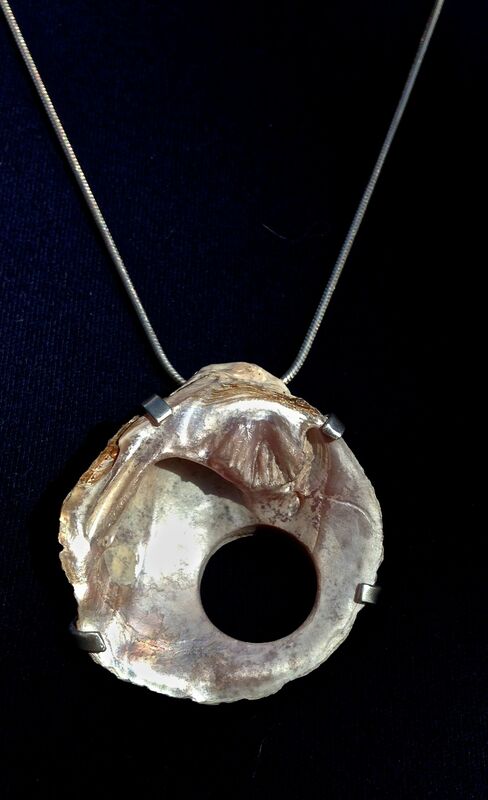 Over time, an idea came to me to create a necklace from one of my mussel shells to give as a gift to my wife, Mary Ann—and as a future keepsake for my children and future generations in my family. A number of years ago, I had known a skilled jeweler in my area, Laurie Ashbach. Mary Ann and I had even had our wedding bands made by her then. I located Laurie through the Internet, and to my delight I learned that she still made jewelry. I met with Laurie and showed her several of my single-button-holed mussel shells. Together we chose one of them for the project and she sketched out a simple design for mounting a silver chain onto the shell and thus creating a necklace. I left the shell with her and returned a few days later to receive her beautiful work of art. I couldn’t have been happier with the results; Laurie had indeed reclaimed the “least of these.” And now our family owns a crown jewel. What’s in a name? I often think of that question whenever I encounter a geographic feature with an unusual or curious name. For example, I recently encountered such a name in June 2018, five years after initially publishing my Mussel Bound personal essay. Here’s what happened. My wife, Mary Ann, and I were traveling from east to west across the state of Montana—a journey we’d made a number of times. We decided to take an early-summer look at the expansive country between Glendive and Lewistown, a landscape through which Montana Highway 200 passes. We’d driven the road before, and I still regard it as one of the straightest roads I’ve ever seen. Several miles east of Lewistown the highway crosses one of the few streams in that area of Montana. As we approached the bridge I saw a sign that read “Musselshell River.” I commented to Mary Ann: “I wonder how that stream got its name? Maybe mussels lived in it at one time—and perhaps they still do.” Then I proceeded to forget about the sign—until the next day. Following our overnight stay in Lewistown, we continued our journey on Highway 200. A few miles west out of town we made a snap decision to divert from our planned route and headed south on U.S. Highway 191 towards Harlowton. There we intersected with U.S. Highway 12 and followed it west. I took note that the highway was following a stream, which Mary Ann with aid of her navigator’s map declared to be the Musselshell River. That settled it; I now had to know how the river got its name—and whether freshwater mussels still lived there? The Musselshell River where it intersects Montana Highway 200 east of Lewistown. After a few miles, we turned towards the Crazy Mountains on Montana Highway 294—and the Musselshell River stayed right with us. As we crossed the river again I stopped to photograph the sign. I noticed we were now following the South Fork of the Musselshell River; something had changed. I later learned that we’d passed the confluence of the North and South Forks, the place that is regarded as the official beginning of the Musselshell. From this starting point the river flows 342 miles to the Missouri River. The origin of the river’s name is attributed to the Lewis and Clark expedition in the early 1800s; they spelled it “Muscle Shell” in their journal references. It is thought that they were influenced by an earlier Indian name for the river that referenced its abundance of mussel shells along the banks. Their incorrect spelling of the name persisted until 1879 at which time the name Musselshell was finally adopted and stuck. 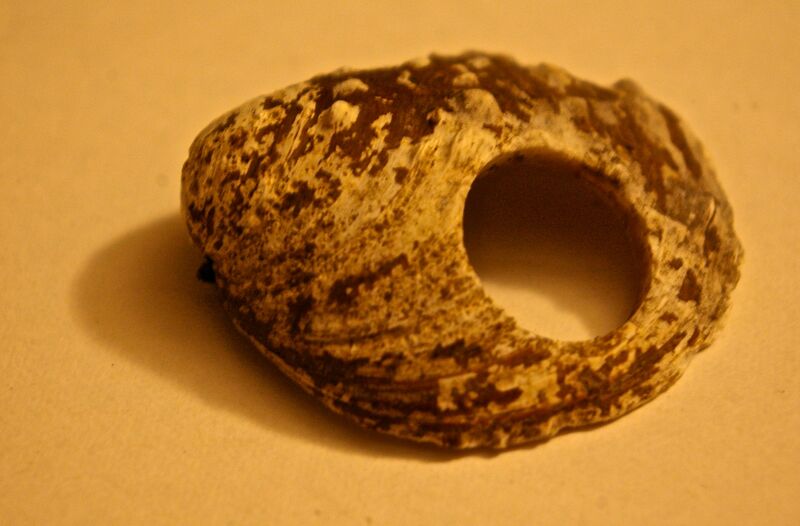 Although the archaeological evidence is limited, it appears that some early American Indian tribes who inhabited the Missouri River watershed made use of freshwater mussels, just as prehistoric people did in other areas of North America. They used the shells for beads, pendants and other decorations, as well as for scrapers. Mussels were also probably consumed for food, although relatively few middens (spent shells placed in large piles) are known to have existed. In 1900, a biologist reported finding large piles of spent mussel shells along two rivers in western Montana. A 3,000- to 5,000-year-old archaeological site along the Missouri River offered evidence for use of mussels there. To my knowledge no archaeological evidence of middens along the Musselshell River itself has been found. Today the Musselshell River is a tale of two rivers. The upper stretch near the confluence of the North and South Forks is considered to be a fine flowing trout stream. Yet as the river proceeds on towards its mouth at the Missouri River, it is depleted by the pumping of water for irrigation. During the drier years, the Musselshell may even cease to flow freely and becomes merely a series of pools. Such conditions are not conducive to supporting populations of mussels in the Musselshell River. Unlike pre-settlement rivers in eastern portions of North America, which once supported dozens of mussel species, the Musselshell River, at best, only had three. That number is now just one; it has the common name Fatmucket. It is thought to be the most widely-distributed mussel in North America and can tolerate warm water conditions. Yet it does require some water, and the ephemeral nature of the Musselshell River in recent decades has greatly depleted even this hardy mussel. So, what’s in a name? In the case of the Musselshell River of Montana, it has little to do anymore with freshwater mussels. Like other identities of lost places in the American West with forgotten meanings, the name Musselshell is an artifact of a long-ago time and a former reality. As with the great bison herds that once waded across the river, the profusion of freshwater mussels that once inhabited the Musselshell will never be seen again. It is a current—and sad—reality. as they tell their tales of something rare and precious. Steve Robert Simmons wrote this personal essay in 2013, 2014 and 2018. All rights reserved. Special thanks to my friend Karen Hannah whose extraordinary encouragement during the writing of this essay made it possible. Fine essay. Absolutely. I enjoy the scope of it from science to sociology to family history to the beauty of the shell, to the life of a river to the life of Howard. A very clear flow of history and time. I’m glad that Howard cared enough to teach you about your homeland. I’m so glad that you’re writing. And I think it’s maybe about time you pulled the homeland essays into a book, eh? What a gorgeous, layered essay. It’s the connections and relationships between the pieces that I find so delightful–how this mussel business connects you to your homeland and back to Native Americans; how a Japanese industry influenced this part of Indiana….the web goes back in time and spreads around the world. And throughout we see your rich love of these connections, your voice stitching the pieces together. Good to hear from you in connection with this essay, Carol. Thanks for your kind words. Have you ever visited Muscatine? It’s on my radar now. Hoping you have a most delightful holiday with your family. All blessings! Very nice essay. It is interesting that my experience with mussels is very different from yours, based on my “growing up” homelands – New Jersey and California – near the salt water oceans. There, mussels were ugly black things that clung to piers and whose broken shells were strewn about nice sandy beaches – sharp ones did not feel great on your feet. I finally tried eating the salt water variety in restaurants about 30 years ago, and I must say they really taste good in drawn butter. I can certainly understand why no one would eat them out of the White River – no one eats anything out of the White River nowadays. You gave me an education about the button industry from shells – I had no idea there were fresh water mussels, much less ones that were so big you could get multiple buttons from them. And of course, the analogies to family were ever so true. Thanks. Yes, Dale, I’ve heard that saltwater mussels are delicious. I hope to try Penn Cove mussels from Puget Sound when we are in that area this winter. Thanks for reading my new essay and sharing your memories of mussels! Steve, I am sorry it took me so long to get to this essay. We have been really busy but I am glad that I finally read it. I knew nothing about mussels but found from your essay that they are fascinating creatures. Also, that they were instrumental in some industries. It is amazing what people use to make things. Thanks again for giving me an education and again showing me more insight into you and your history. Have a Merry Christmas and hope to see you while you are out this way. Thanks for your response to my new essay, Don. You are such a faithful reader. Glad you learned a thing or two about mussels too. 🙂 I’m hoping to have a chance to sample some Penn Cove mussels the next time I’m in your neck of the woods. They’re saltwater mussels, but probably as close as I’ll get to eating the real thing. This was great. It was so enjoyable to me to see how you interwove your family connections with all the facts of mussels. I too, learned a lot but most interesting to me was your family connections. I could see you smiling and feel your joy in your own discoveries. Keep smiling. writing and sharing your joy. Thanks for your response to my essay, Shirley. Yes, the family connection was what motivated this essay in the first place, although it also tapped into my interests in prehistoric North American cultures and biology/ecology. Yes, WE’ll keep smiling and sharing our joy in 2014. Looking forward to our future connections. When I was a child in the 1950’s, we lived up the road (“Chicken Farm Road” now) from Knofel and Grace Holt. There was evidence of a “button factory” at their place, because we had to be careful to not cut our feet on the punched out shells. Their home was featured on the cover of one of Bill Whorrall’s books about Martin County. I used to ride the school bus with Mary Lou Billings, who lived on around the road past the river. My dad had a wet suit, and I remember when he would dive for mussels. 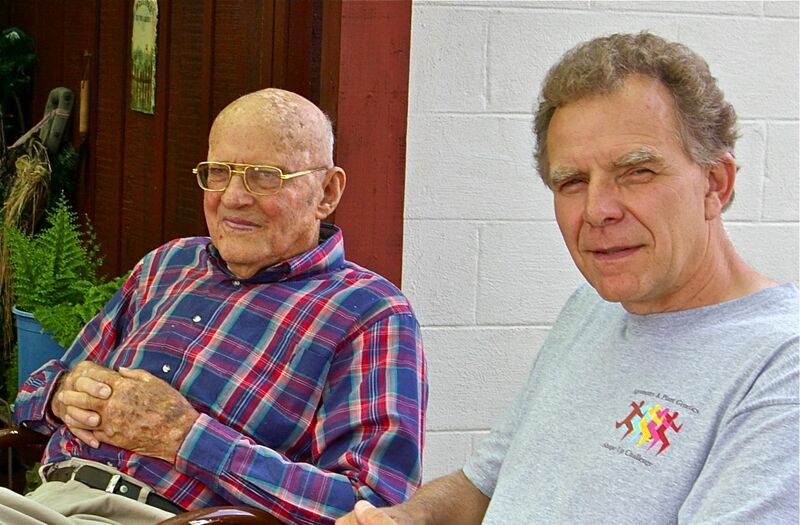 I went to church with Howard and Blume Sherfick at the Shoals Christian Church, as well. I personally found your essay interesting because of these connections, as well as for the information it contained. I am an old Shoals girl (SHS, Class of ’62), who coincidentally now lives in southern Jackson County, IN. I am firmly attached to my life in Jackson County, but most of my family still live in Martin County, and I visit reasonably often. So good to make your acquaintance, Brenda. Thank you for taking time to respond to my “Mussel Bound” essay. It’s fun to know that you have intersected with BOTH of my southern Indiana homelands–Martin and Jackson Counties. My wife and I attended the Shoals Christian Church with Howard and Blume and have been there more recently too when we visit. I have a side question for you: I noticed the name of your friends on Chicken Farm Road, Knofel and Grace Holt. My grandfather and grandmother were Lee Knofel and Grace (Green) Simmons. They both grew up in Lost River Township of Martin County and I find it interesting that they shared the same names as your friends. In fact, I’ve never known of anyone besides my grandfather with the name Knofel. Do you know how common that name is in that area of Indiana? Sometimes I’ve seen my grandfather’s name also spelled “Knophel” or “Nofel” or “Nophel.” His headstone in Waggoners Chapel cemetery shows his name as Lee N. Simmons, which seems to favor one of those latter spellings. Since his first name was actually Lee, he mostly went by that name. Again, thanks for responding to my essay, Brenda, and I hope that our paths might cross sometime when I’m back in either Martin or Jackson Counties. It would be a pleasure to meet you in person. Thanks to Facebook, I was afforded the chance to read your excellent essay about the mussel industry and its effects on Martin County, and especially the area around White River and Shoals. Your “twin cousin” Mary Lou and I were high school classmates, as well as living near each other. Additionally, you mention the name of a lady named Dyer, and I believe another cousin of Mary Lou (Joan Dyar, who was also in our high school class) comes from that part of her family. Your friend, Howard Sherfick’s brother, George, is married to MY cousin George. Also, almost every family I know living along or near the East Fork of White River has had family members at some time in the past “digging shells”. Your splendid writing, along with my own interest in our own Martin County and its history, made this an especially enjoyable piece to read. Thank you. Just noticed that, in my haste, I mentioned my cousin being “George”, when her name is actually Jewell, George Sherfick’s wife. Enjoyed it so much. Howard was my neighbor. Linda and I are the same age, David and my sister Susie are the same age, then I had three more siblings, which one of them I believe Jackie was Danny’s age. Also, my grandpa that had the Denny’s Truck Stop 2 doors west of where Howard and Blume lived. I live there now, in fact I live in the bedroom I was born in. My grandpa was a known fisherman of the time as well as a mussel digger. He would but a 5 gal empty bucket upside down over is head and go under water. He would leave the bucket in that position and swim around looking for mussels. Then when he needed air he would put his head up inside the bucket. He came home one day when (I was in high school) with the most horrible cut from his knee to his ankle, open all the way to the bone. Grandma was tough, mean person and refused to take him to the doctor. I made him go with me, but not until he told me he had to poor turpentine over the cut. I knew at the time that burnt like you know what! We get to Dr. Beemblossom across from the school and he asked him what he did to clean it up, and I told him. He said, “He’ll be fine,” He didn’t sew it up because he said it needed to heal inside out. He had him wrap it and told him to stay out of the river till it was healed. That hurt my grandpa’s feelings, not fishing, no musseling. My mom being French ate all most anything. She tried the mussels when she came here. She cooked them forever, they were so tough and the flavor was bland. She never tried eating any again. Loved your story. The Sherfick Family were good neighbors. I forgot to mention, when my father-in-law and his old army buddy came down from Michigan, they’d go musseling. George, the army buddy found a pearl in one and gave it to me. It was oblong which I gave to my daughter and told her one day to get it made into a ring. I’ve noted your contact info, Marie. I’ll get in touch with you the next time I head towards southern Indiana. I will also look for your county photos on Facebook. Thanks for the tip. 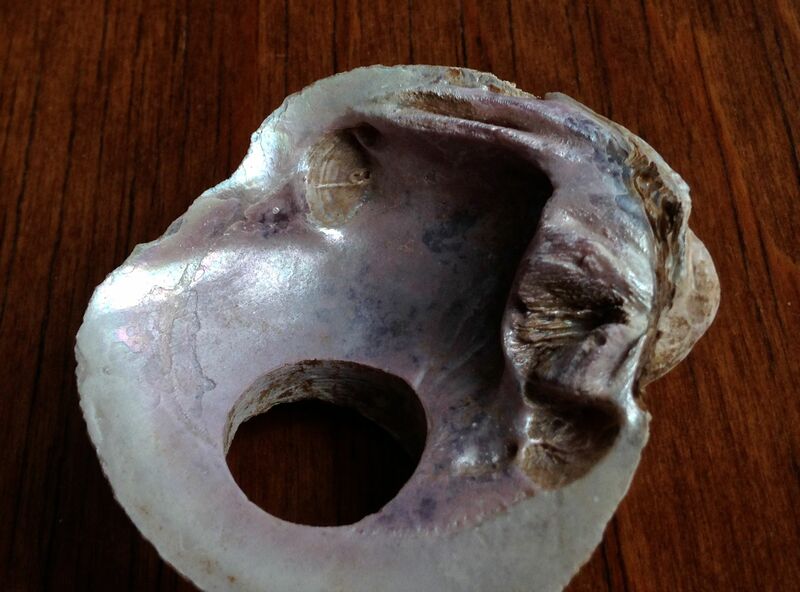 My limited knowledge of freshwater mussel pearls is that they often form in an oblong orientation, which makes them more unique than a typical oyster pearl. I would think that your daughter can make a nice necklace or ring from the one you have given her; and it will become an heirloom too. 🙂 Thanks again for responding to my essay; I look forward to meeting you sometime. I enjoyed reading your essay about Mussels and the connection to Martin County, Indiana. Many of the families mentioned were familiar names with life in the region. As a youth in the 1960’s, I too dug mussel shells to buy school clothes in the fall. The Japanese demand for shells had driven the price of shells up and the money was welcomed from families who knew how to “work the river”. The work was hard but money was money. It is sad that we knew very little about conservation in those days. The mussel population would not have suffered the decimation it did. Thanks for reading my essay, David, and for offering your response. As I noted in the essay, I expect that if mussel harvesters had continued to use the old-school methods that you and Mary Lou did in the ’60s, the mussel population might have fared OKay. The last I heard from the conservationists, some of the mussel species have begun to rebound somewhat although it’s unlikely they will ever be present in the numbers they were 100 years ago. Billings as a teacher and Marie Hawkins and Linda Sherfick are close friends. Thank you for the opportunity to read your essay. Howard and Blume were my grandparents. They were the best of the best and I miss them terribly. Grandpa’s love of history, nature, family, and all things Martin County is evident in your recollections of his time spent with you. I appreciate the trip down memory lane. It’s good to “meet” you through this WordPress site, Tamar. Your grandparents Howard and Blume were so special, and everything you have offered rings true with my own recollections. They were very proud of you, their grandchildren, too. Even though my wife and I had not met you, they often spoke of you all whenever we stopped through Shoals to pay them a visit. Thanks so much for reading my essay, Tamar, and for responding to it in this way. Wow what a small world Steve, I didn’t put 2 and 2 together. I have known Tamar and her brother and sister my whole life and her parents have been friends with my parents since high school. Its amazing how this world works. I’m Jim Marshall president of the Martin County Historical Society, Shoals, Indiana. I really enjoyed your essay. I personally have a mussel gathering boat, mussel tongs, short fork, crowfoot bar, diving unit, button cutting machine, button slugs & shells, also my wife has a ring made with a pearl taken from a mussel here in East Fork White River. 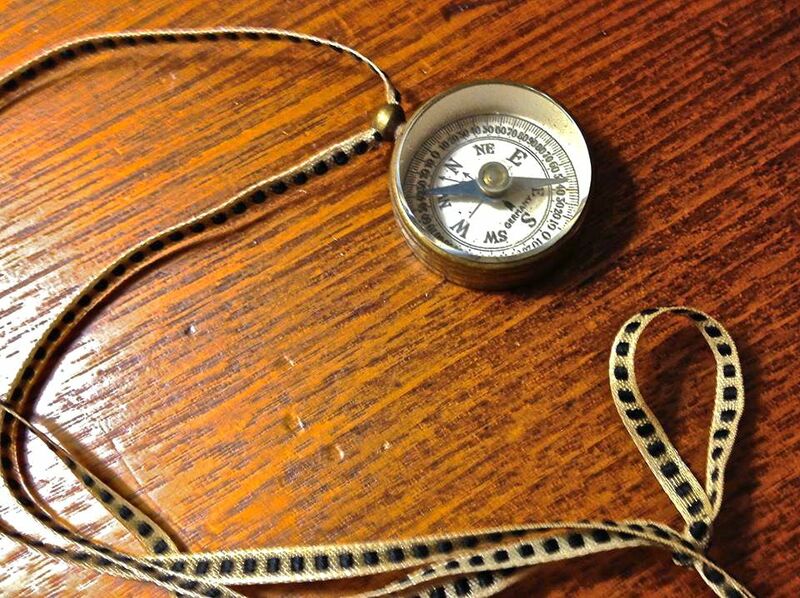 If you would like to see any of the items I would be glad to show them to you. Discarded shells were used on roads. Edges were not sharp enough to cut tires. I still see one know and then on our lane. Mussel meat was good for fish bait and often fed to hogs. My dad bought shells for The Tennessee Shell Company. The Japanese, who were the ultimate customer, visited our farm where the shells were purchased. Digging shells was very profitable for us kids. Thanks for sharing your recollections of mussel shells in Martin County, Dan. I’ve heard of shells being used for roads in Florida, but didn’t know it was also done in Martin County. I have heard of mussels being used for fish bait and hog feed. Do you happen to know how much a load of mussel shells were worth to the Tenn Shell Company? It was nice to come across this writing. My Aunt Reva, quit school at a very young age to help her mom and dad support their family. She got up early to get the two younger ones’ day started and went to work in the “button factory” in Shoals. Those hard times affected the family in many ways. One of my dad’s “jobs” was passing newspapers. He got to graduate from Shoals High School, but my aunt did not. I was moved by your article. Thank you for another bit to my family’s history. Nancy, thank you for taking time to read and respond to my personal essay about the mussel button industry in Shoals in the early 1900s. It’s good for me to hear from folks for whom the button industry was an important part of their lives. I’m pleased that my essay helped add to your understanding of your own family’s history. Wonderful essay! I have a whole drawer of the mussel shells with Buttons stamped out of them. I found them while digging along the Ohio River and I have been collecting Buttons for 40 years now and I never get tired of Buttons or anything Button related. Thank you for all the great history and personal memories. Didn’t know that about the origin of the name of Shoals, Indiana. Thanks for sharing. We were taught in school, the name came from the shoals in the river. Thanks, Marie. That makes sense to me, and especially in view of the large mussel populations that used to live in the river there. I so enjoyed reading this essay of yours and the history you have enlightened me with. I never knew anything about mussels in North America and the millions in the White River of Indiana . Thank you for sharing all this knowledge with me. Once again you broach a subject that I have never spent much time thinking about. Thanks for the insights. Sorry it took me so long to get to this essay.